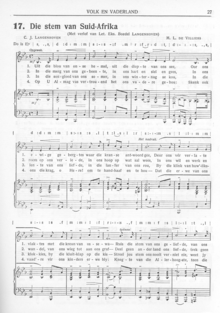 ^ 1.0 1.1 SA National Anthem History. [2007年10月21日]. ^ Act of defiance. [2007年10月21日]. （原始内容存档于2007年10月15日）. ^ The 1992 return match - Teams, Anthems and Haka. Youtube. ^ Summer Olympic Games: Ode to Joy. The New York Times. 1991年11月24日 [2007年10月21日]. ^ Anthem: South Africa sing passionately at RWC 1995. Youtube. ^ EFF ‘missing the plot’ on Die Stem - HeraldLIVE. 2015年9月27日. ^ Carlin, John. Playing the Enemy. New York: Penguin. 2008年: 147, 153. ISBN 978-1-59420-174-5. ^ Carlin, John. Playing the Enemy. New York: Penguin. 2008年: 173–178. ISBN 978-1-59420-174-5. ^ The surreal moment when a Harlem choir sings Die Stem for Winnie. ^ Haden, Alexis. EFF calls for removal of Die Stem on 120th anniversary of Enoch Sontonga's death. 2017年4月18日. ^ Die Stem adulterates Nkosi Sikelel iAfrika – EFF. ^ Great Britain apologizes to South Africa for playing apartheid anthem before field hockey game. ^ Oh, Say, What’s With All the National Anthem Mistakes?. 2017年2月13日 –通过NYTimes.com. ^ CNN, By Richard Allen Greene,. Britain apologizes for playing apartheid-era anthem - CNN. ^ Apartheid-era anthem fires up South Africa team. ^ The Road To London Is Paved With Olympic Gaffes. ^ South Africa want apology for anthem fiasco. 2012年6月6日. ^ UK's Die Stem Blunder. 2012年6月6日 [2018-09-21]. （原始内容存档于2018-09-19）.